At long last, the dreary days of winter are fading behind us and the earth is coming back to life. Flowers are in bloom, birds are singing, and the temperatures are fairly comfortable again. With Easter close at hand, it gives us all a chance to bring some of the freshness in and add pops of colour to our homes too. Whether you’re planning a traditional family Easter dinner or a fun day for the kids, a bit of holiday décor is sure to add to the festivities, but where to start? Here’s a look at four unique inspiration rooms to help you craft your own perfect holiday. There are as many ways to do up an Easter tree as there are ways to decorate eggs. This particular one is suitable to accompany contemporary design, draped with a handful of delicately-coloured eggs and topped off with dainty white flowers. The yellow boxes on each plate add just the right amount of contrast without overpowering the calming display. For an easy DIY, regular branches can be used inside a vase or ceramic jug, to create a look similar to the one pictured here. Tasteful pops of green help this display flow beautifully together. This design also has a tiny splash of yellow in the nest, brightening up the room. 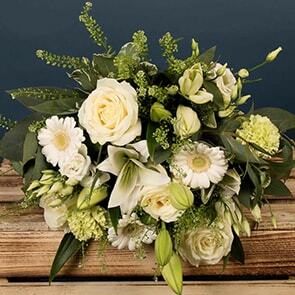 Crisp white tulips, the quintessential bloom of spring, serve as a centrepiece. This type of setup would be perfect for brunch and will still be suitable for the season even after Easter passes, with just a few minor adjustments. White tulips are tucked away in this rustic chic display as well. Like the others, white ceramics make and appearance too, but that’s where the similarities stop. This one is all about earthy elements, such as the garland, wreath, and spheres. The wood elements add texture and help make this scene feel more like an emerging spring than the season in full swing. If you’re the DIY type, don’t hesitate to dress up your space with a custom vase. To create the look seen here, stack two vases together, with the flowers and water in the innermost vase. Then, carefully arrange objects in the space between the two vases. With this one, it looks like they’ve used cereal and gumballs, but jellybeans, coloured eggs, Easter grass, and even real carrots can all create visual interest. 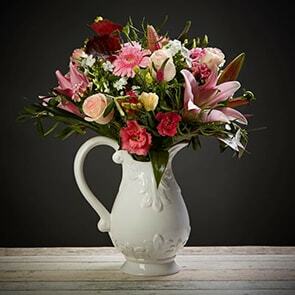 If an Easter bouquet will be part of your décor or you’d like to send one to someone to let them know you’re thinking of them this Easter, our Spring Flowers are appropriate. 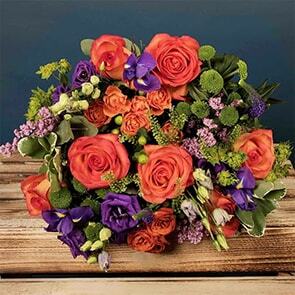 Vibrant tulips in many colours are also on hand, both with same-day delivery in Dublin and next-day delivery throughout Ireland available. 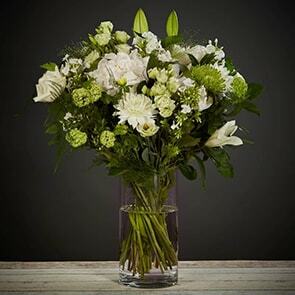 Order flowers online now and your hand-tied bouquet will arrive in perfect time for the holiday.